There needed to be a simple, easy and free way to share and network the people we know and meet. Of all the people I meet, rarely do they even talk about or mention other people they know and network with. Many people carry around their little collections of business cards, but they guard them with their life. I see too many people going to networking functions and going through the motions, but having few real conversations that actually help other people afterward. And meeting someone one on one, it is just not possible to ask enough questions to any one person, to cover all the people you know, like, trust and care about to discover how to fill a potential need. Few people are actually creating connections and conversations for other people from among the people they know and meet. I needed a way to more effectively share more of the people I want to share. People would say they are not getting any leads... But they are not giving any leads either... Go Figure! This is because they are not talking to and learning more about other people. And of course, we may not be as effective at sharing ourselves as we may like to think! The Blogger Networking Formula is a simple way to create and initiate more conversations and help more people beyond what you sell... Thus helping you at the same time. Help the people you know, like, trust, care about (not necessarily all three or four criteria), help them to meet and connect with and have a networking conversation with new people and with one another. The more conversations you have, the more likely your business will grow, through that person... or through someone who someone else knows. The more you help others, the more they will help you. The best way to have your better life... is to help others have their better life! For every person you add to your blog as an introduction, a new potential conversation is started between everyone else in the blog and everyone who looks at your blog. Invite other active networking people to view your blog and to subscribe by email to your blog. Promise you will not do active posting more than once or twice a week. You don't want to kill your subscribers with emails. They would get one email per day. for every day you make a post. So... Schedule your posts for once per week. You can create without posting. 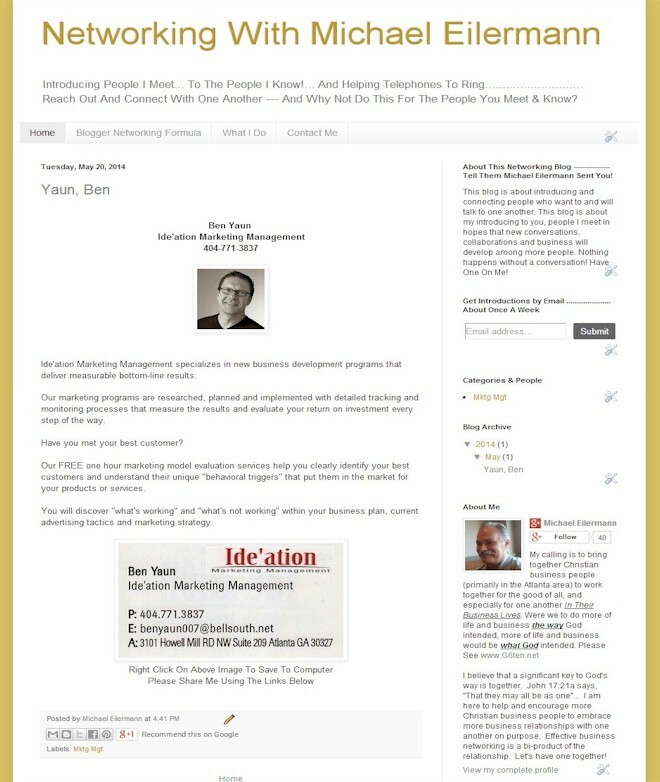 Stay in contact with the people you add to your networking blog... They are in fact your network! Remember, Your net worth is in direct proportion to your network!... Think about that. There are many considerations when doing this that you may not think of... I Can Help! I have created a very comprehensive 13 page 'How To' document covering all the basics relating to the why's and the exact 'How's', complete with images & graphics and Special HTML code tweaks to really make this work for you. Frankly, I Can Think Of No Good Reason Not To Do This If Your Business Is Built On 'Word Of Mouth' and Business Networking. Embracing the Blogger Networking Formula Will Give You More To Offer Most Anyone!